When you think of DeSantis Holsters, you might think of traditional leather holsters, law enforcement equipment or gun gear made for cowboys. At least that’s what I had in mind before I began digging a little deeper. I really value the quality DeSantis puts into their products, and it’s my belief that a holster should be functional first, as opposed to worrying about the aesthetics first and then wondering if it will support my firearm. So many times products that are made for women specifically (with the exception of a few companies) tend to be sub-par or only work if you are a size 2 or carry a mini-gun. If we as women are going to take our personal defense seriously, and in this case concealed carry, then we better start demanding a little more from these companies that want to cater to women. Three such products from DeSantis really fit the bill when carrying concealed in all circumstances. They’ve been tested by me, a size 12 lady who wears too many hats to mention other than I work a regular Monday through Friday 40 hour office job, run my own personal defense business, edit a firearms industry magazine, run a blog and write for an online personal defense publication. My point is that these holsters worked for every scenario I threw at them, and they did it very well. 1. 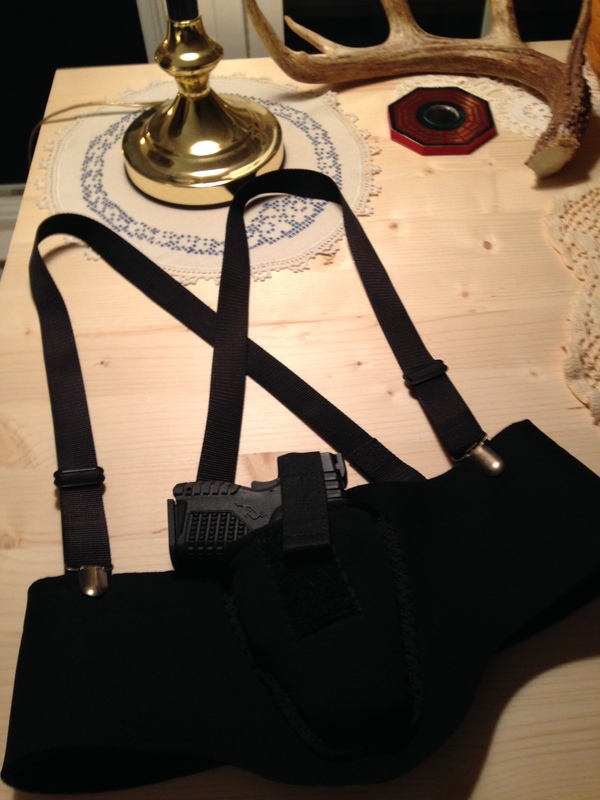 The Stowaway – I’ll admit, I have a little crush on this holster, but I didn’t at first. When initially viewing the Stowaway, it looked cumbersome, complicated, bulky and just overall weird for a woman to wear. No joke. But I work out quite a bit and teach personal defense classes sometimes in unconventional places, so I wanted to find a holster that would work with athletic attire, would stay in place when I ran or moved around, and was washable if it got dirty. It was comfortable, didn’t print, and held my single stack 9mm in place with ease. I first wore it to work under my business clothing. No one ever noticed. I then changed into my athletic clothing for the classes and my workout. Still no problem. The gun is pointed in a muzzle-down position when holstered, resting right on my sternum. To deploy, I pull my shirt up with my non-dominant hand, take the firearm up and out of the holster (there is a Velcro strap holding the firearm in place) into a high compressed ready position. It’s a simple deployment. I’ll be carrying with the Stowaway quite a bit, even in the summer. 2. The Bag Packer – Neat little invention. 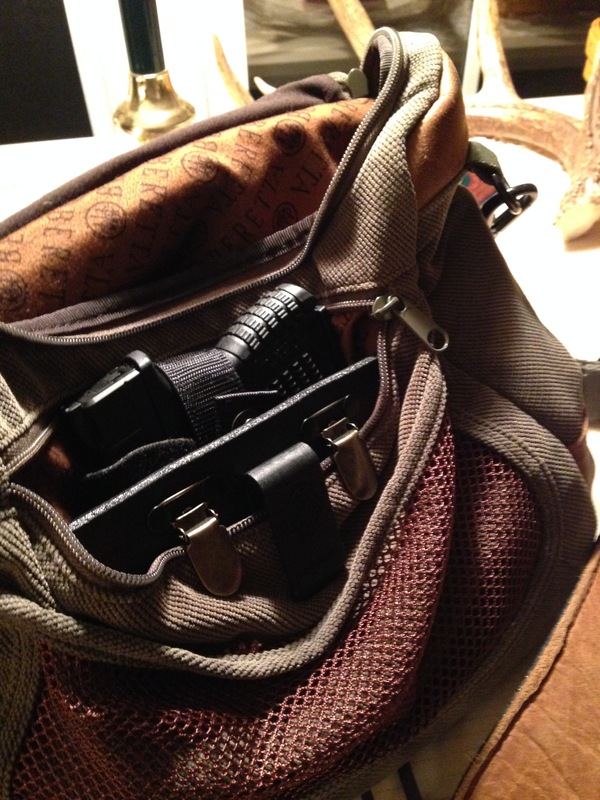 The Bag Packer turns almost any satchel into a concealed carry bag. I didn’t say purse, because it might be a computer case, a man bag, your favorite tote or any number of different shoulder-carrying purses. Here’s how it works: The stiff square insert is outfitted with industrial Velcro on one side and two types of fasteners on the other. It attaches to a pocket or divider inside the bag. A soft modular piece detaches from the insert and wraps around your firearm, staying fitted to it by Velcro straps. This allows for all types of firearms to be carried. Once you have the fit you want around your firearm, attach the wrapped firearm to the insert by matching the Velcro pieces. I practiced deploying my firearm from a few different bags. I found that the taller the purse and the higher the pocket where I had to attach the insert, the more difficult it was to keep my firearm from flopping over in the bag. But on the shorter bags or the ones with lower/deeper pockets, there wasn’t the ‘flop’ problem at all. There’s a snap closure at the top of the holster that I easily flipped open with my thumb before deploying the firearm. Did it work in all scenarios? No, but I didn’t expect it to. Satchels/bags/purses are so varied, that it would be almost impossible to make one insert to fit them all. But it did work for most, and I will be using this one again as well. Side note: I do not normally carry off-body. I believe it’s much better to carry holstered on-body whenever possible. But there are times when off-body is going to be the choice of the day. And now I can CHOOSE which bag fits my attire, not what outfit matches my concealed carry bag. Nice touch, DeSantis! 3. 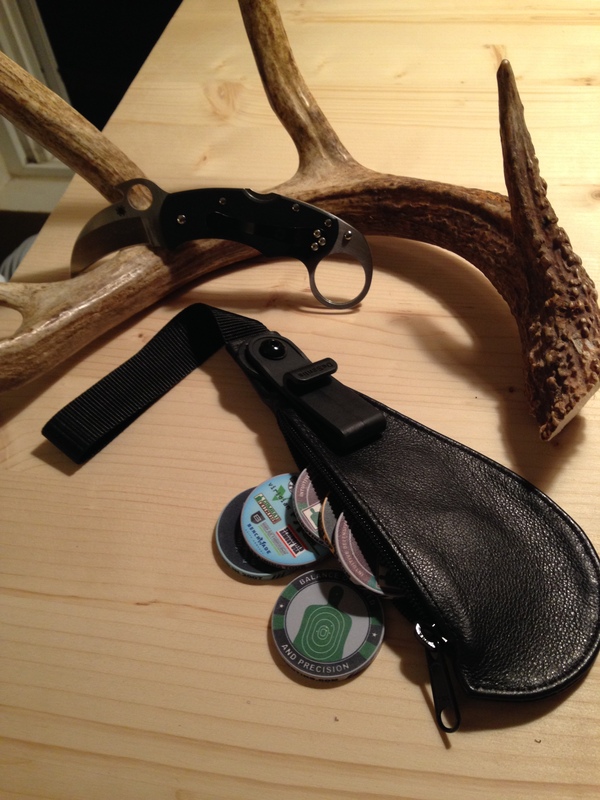 The City Slicker – While this isn’t a holster, I promise you can’t be without one of these. Do you remember seeing something called a ‘sap’ carried by police officers back in the day? Probably not, but I’ll bet you’ve seen them used in the movies. It was a little leather piece in the shape of a tear drop with a handle that wrapped around your wrist at the small end and a weighted metal ball in the bottom portion. It was used as a striking device, meant to be swung around quickly and “thwapped” against something or someone. DeSantis has re-created something similar, but it’s more like a coin purse (of sorts). The City Slicker is made of fine grade leather in the shape of a tear drop with a handle at the top. The interior of the leather portion is completely empty; a pouch if you will, with a zipper on the side. A roll of quarters fits nicely inside; maybe two. The leather portion slips inside of your pants, sitting about where you would appendix carry (to the right or the left of your belly button). There’s a hard plastic clip at the base of the handle that keeps the bag attached to the waistline of your pants. The handle can then be tucked behind the bag into your pants for a quick retrieval. Unless you wear your pants unbearably tight around the waist, you shouldn’t have a problem deploying this at all. As most of you know, I love practicing my Eskrima strikes, so I took this opportunity to use the City Slicker as my weapon of choice. Striking either in an upward motion from deployment or a downward motion as a second strike (never waste a striking opportunity) proved to be quite effective. I’m no slouch when it comes to force in my strikes either. I wanted to test the durability of the soft leather to see if it would hold up. Sure did. My heavy bag in the garage has the marks to prove it. So the next time you are thinking about a holster or a personal defense item, tempting as it is, try not to only look at the trendy new manufacturers that are out there enticing women with the latest and greatest. I’m perfectly fine with my holsters and personal defense items having less frills and more function. I’ll get my lace and satin from Victoria’s Secret.